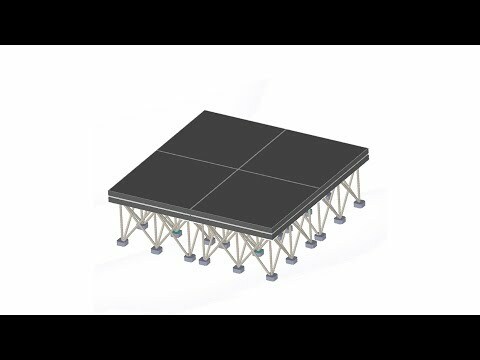 The ProX Portable StageX series 4' x 4' Non-skid Industrial finish surface Stage is designed to provide a stage unit that is extremely versatile and easy to assemble. The ProX StageX is the best solution for anyone looking for durable, dependable and affordable stages. A sleek laminated Honeycomb pattern is integrated into the surface to provide added non-skid protection, yet it's still smooth enough to dance on. It is rugged enough to withstand various types of uses including: chair risers, tent flooring, fashion runways/catwalks, sound wings/troughs, orchestra pit covers, ceremony risers, etc. The StageX series is constructed from an all-aluminum extruded frame, The Surface is constructed with 5/8 inch high-density plywood with non-skid laminate and 6061T6 aluminum profile on all sides and is able to support up to 185 lbs./sq. ft. (900kg/sq. meter). Each 4 x 4 stage is equipped with an integrated platform interlocking system; the locks are built into the frame for quick connecting of multiple stages to one another and also allows easy set-up of risers. The StageX Portable Stages are strong, easy to set-up, have a professional appearance.